Finding a rental home in the off season can be a little more difficult than during the typical PCS months, especially if you have a pet to consider. We love’em, but those furry family members can make moving even more stressful. 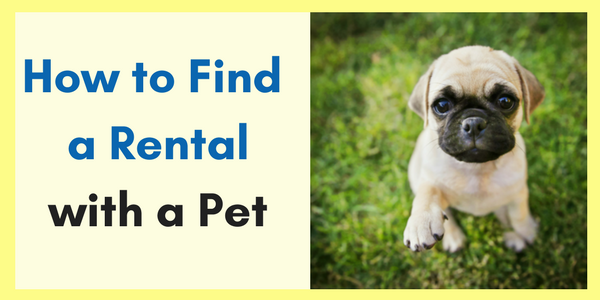 First, you have to find a home that will consider renting to family with a pet. Next is the decision as to whether or not you need, or can live without, a fence. 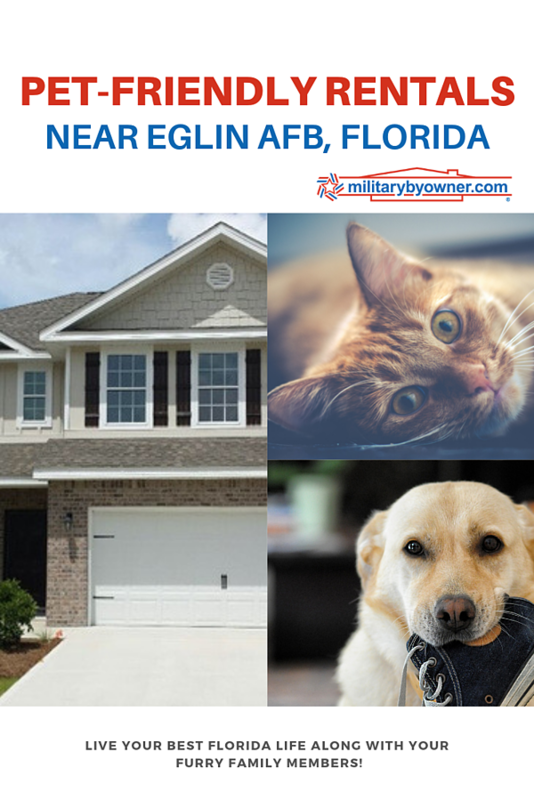 Pet friendly rentals near Eglin Air Force Base are showcased today as MilitaryByOwner’s Homes of the Week. For those looking for homes in Freeport, Mary Ester, and other cities near the base and have pets in tow, you can reach out to these owners and discuss the potential to move your extended fur (or scale) family in. To have a dog park in the neighborhood is a pet owner’s dream. Wake up! Because this rental comes with access to Canine Commons Dog Park. There will be lots of dog friends and new neighbors to meet, but if you don’t make your next best friend mingling there, head over to two different pools, fitness center, ball courts, and walking trails. All are accessible with your signed lease. The human family members are going to fall in love with the long list of amenities of the home, starting with the ample space. Over 2,000 square feet supplies 4 bedrooms and 3.5 bathrooms, in addition to a bonus room that doubles as a second living area. The master bedroom has two walk-in closets to avoid any spouse traffic in the morning while getting ready for work. All of the bedrooms stay cozy due to the carpet. The rest of the house wears easy to clean hardwoods or tile as flooring. 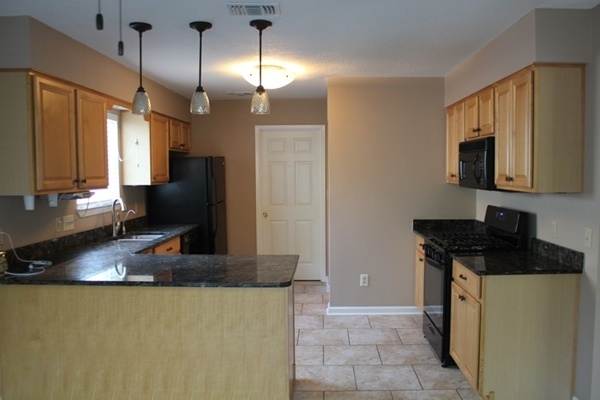 The kitchen has updated appliances and the sight line from the screened in porch gives way to the lake view. Your family will enjoy agreeable Florida weather in the fenced backyard—a bonus for dog owners. The two-car garage supplies more opportunity for storage, cars and otherwise. You know what your pets hate? A long day spent alone while their parents work. 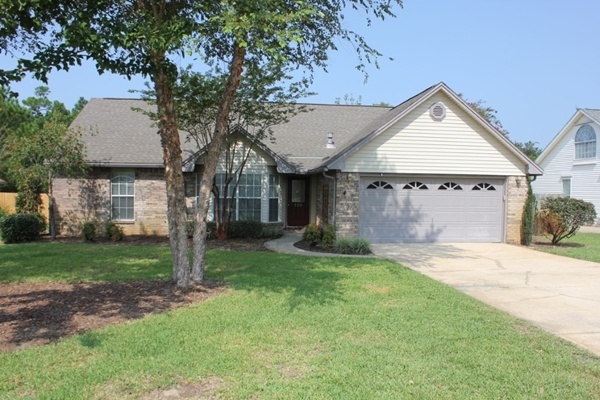 Avoid extra hours spent in traffic by moving into this rental with the perfect location. 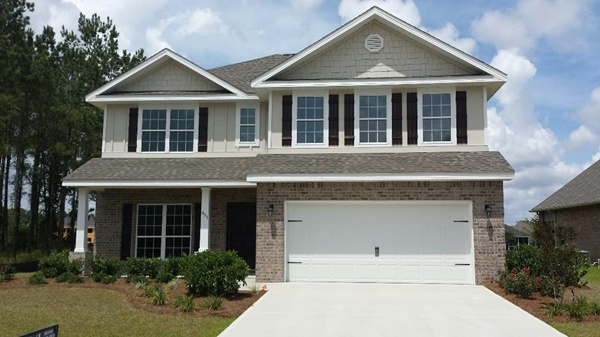 Emerald Pointe in Okaloosa County is less than 10 minutes to Hulbert Field and about 20 minutes to Eglin and is surrounded by all of the shopping and restaurant options that Pensacola and Destin have to offer. With your extra free time, walks to the Santa Rosa Sound with leash in hand will be common occurrences, instead of once-in-awhile treats. Plenty of play time is available not just for pets, but for the whole family in the lush, fenced-in backyard that includes a play set-- an extra feature that’s hard to come by. The owners upgraded several of the home’s features, including: new carpet in the bedrooms, porcelain tile in the bathrooms, kitchen, and foyer, high end laminate flooring in the living spaces, neutral paint throughout, ceiling fans in every room, including the screened porch, and updated light and bath fixtures. 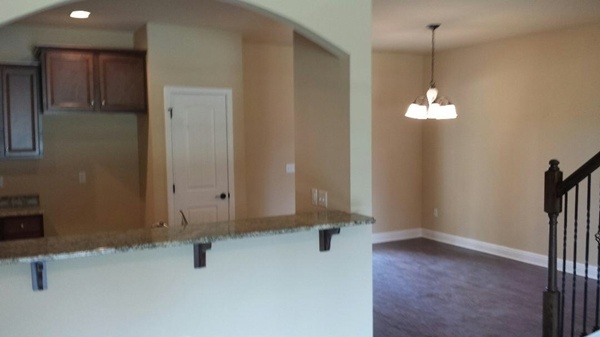 Don’t forget to check out the wood burning fireplace and vaulted ceilings with skylights in the family room. They’ll add the perfect ambiance for every occasion. For those who prefer a downstairs master bedroom, look no more. The en suite is outfitted with two separate closets and dual vanities. One more bedroom is downstairs, while the remaining are upstairs. The loft rounds out the living spaces in the house. It’s a lucky day when homes for rent that consider pets are as pleasing as these two. Eglin Air Force Base has several great cities for military families surrounding its perimeter. For more pet friendly options consider homes for rent in Niceville, Navarre, and Fort Walton Beach.